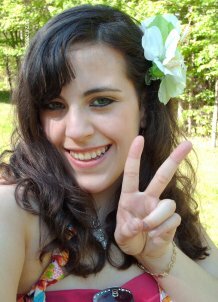 My first look (below) is a super cute preppy bohemian look from American Eagle. To create this look, I picked a basic earth tone dress and added so earth toned accessories to give it a boho feel! 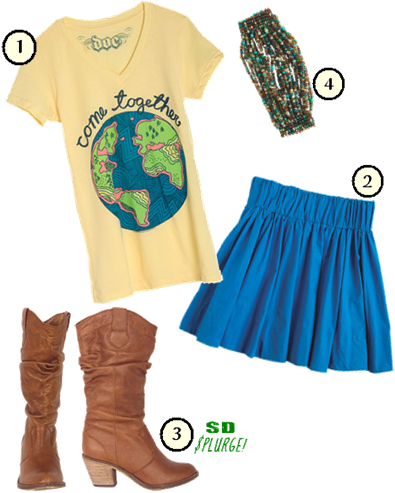 My next look, from dEliA*s, features a flirty & bright colored skirt with a cute graphic tee and some super cool cowgirl boots! I also added a beaded bracelet for a little extra flair! For my funky look, I chose some really bright and colorful pieces from Hot Topic, including skinny jeans and red hair extensions!! Also, for us Twilight fans, I added a team Edward bracelet set to bring it all together! For my third look, I picked a preppy style from Aéropostale. 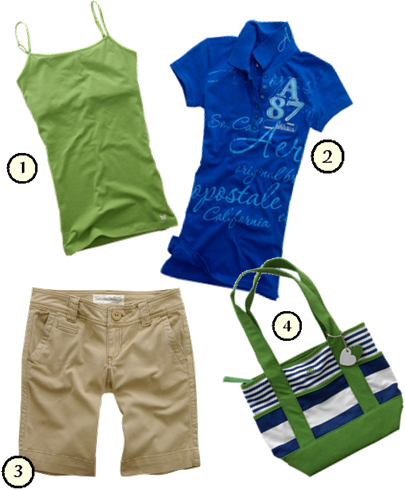 Khaki Bermuda shorts and a bright polo make a really chic and cool preppy look. I pulled this outfit together with a matching tote! For all of us artsy chicks out there, I pulled together this pastel colored outfit from Wet Seal! A painted looking printed skirt looks great with a basic tank, a cute necklace, and a stand-out pair of earrings! For this romantic look from Charlotte Russe, I used some more work appropriate pieces. These striped trousers look great with a flowy printed top! I pulled this outfit together with a pop of color in the shoes and the necklace. For a night on the town, try this urban look from GoJane.com - an online exclusive store! Rhinestone studded jeans with a cute graphic tank and super hott pink pumps are great for a party! To pull this all together, I added a super cute heart ring and a matching belt! For the active fashionista, I put together this sporty look from Target! Make a cute pair of sweats girly with a ruffled jacket and a cute pair of flip flops!